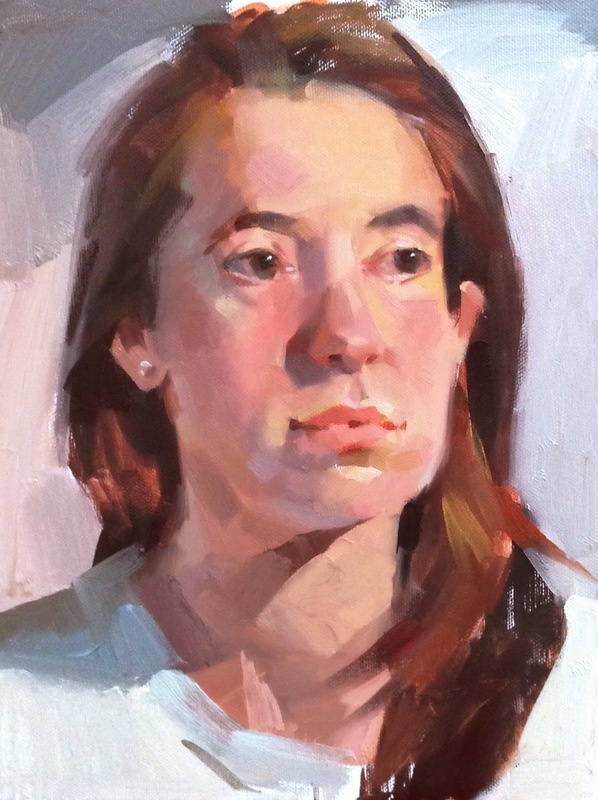 Earlier this week I headed up to Portland, to Sequoia Gallery and Studios, for a Zorn palette portrait demo. With only 90 minutes to paint, I had to work quickly, but sometimes that's a good thing! It certainly cuts down on any perfectionist tendencies I might be harboring. I have a TON of workshops coming up. 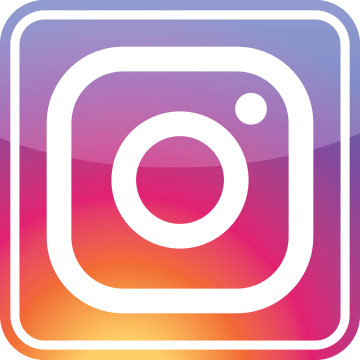 To see a complete list, check out my Workshops page. Thanks for looking! 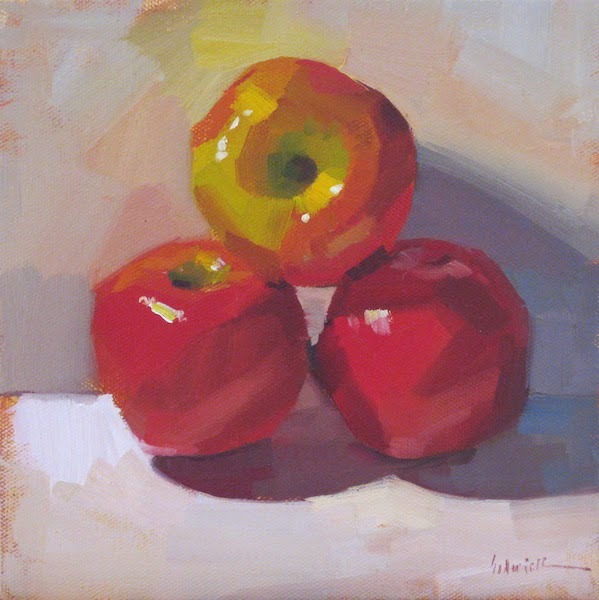 Here's a painting I did using only the primary colors (Cadmium red, Cadmium yellow, and Ultramarine blue), plus white. 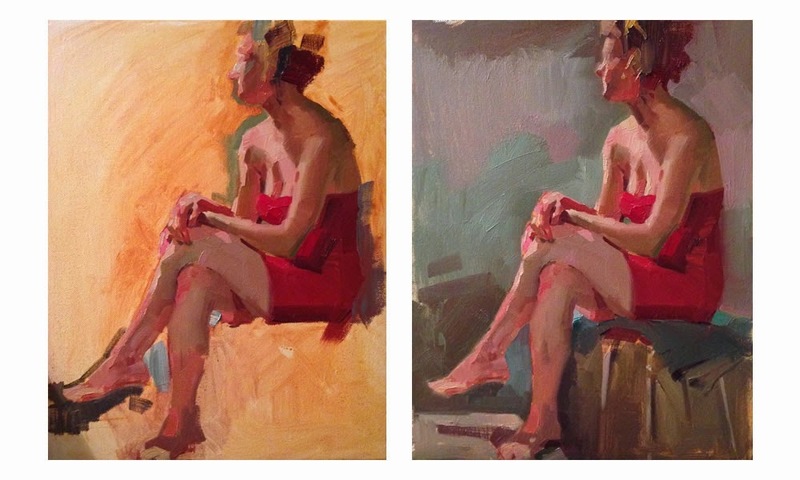 A great way to capture truly brilliant bright reds is to lighten them by adding yellow instead of white. Titanium white has a blue cast, which ever-so-slightly cools and dulls orangey Cad red. 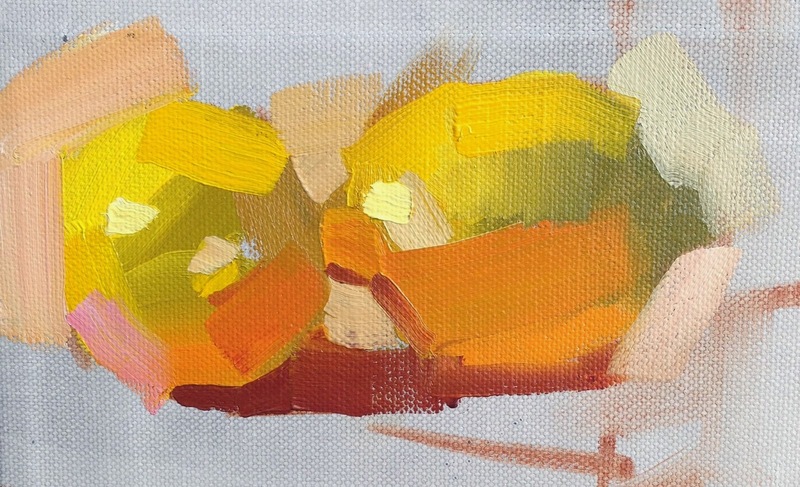 A dash of yellow lightens it, keeps it saturated, and gives it a warm kick that helps it advance towards the eye. Here are the three stages of my painting. First, I tone the canvas with a dull orange I mix from all three colors, laying in my drawing and pulling out some highlights. Second, I firm up my drawing with a darker shade, indicating my darkest darks and noting the overall value scheme. And third: add color! Back in the studio, feeling excited about painting! Working hard on the concept that if you nail the value, you can really use any color you like. And using contrast to reinforce my focal point. Notice how that little triangle of purple next to the bright yellow slash ever-so-subtly keeps your eye on the glass float, front and center? That's a complementary color contrast at work! 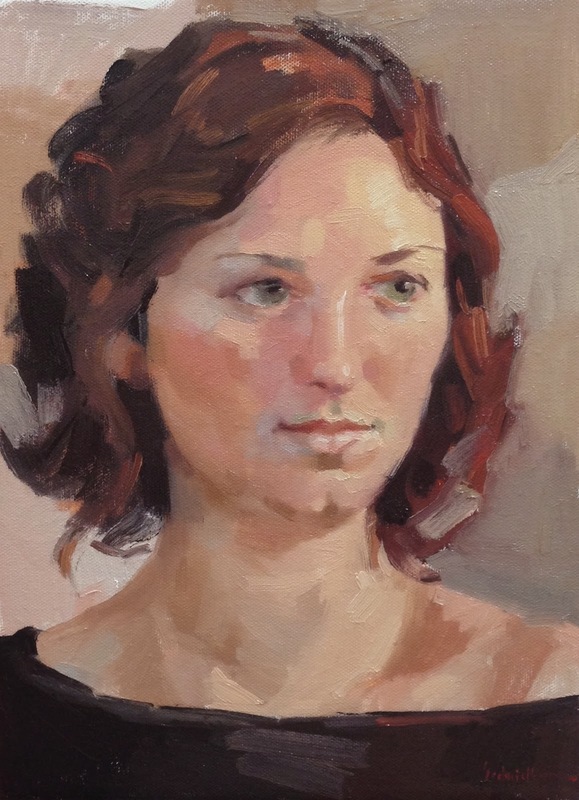 Speaking of work: I've got a portrait workshop next weekend, Feb 20-22nd, at Oregon Art Supply with two spots open. 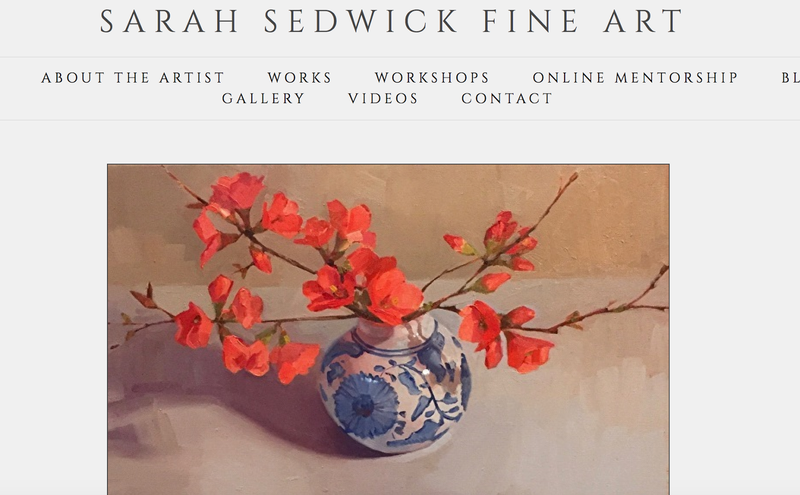 Sign up if you feel like working with me - and having fun too! 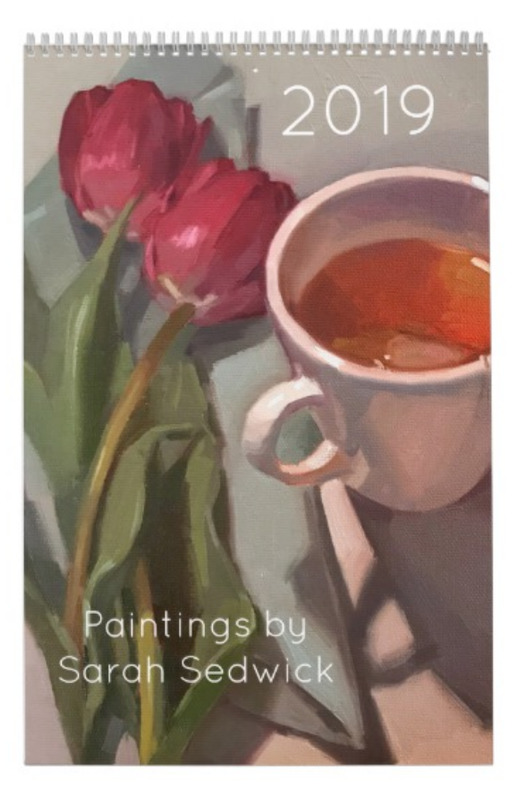 Still Life Painting: The Next Level! 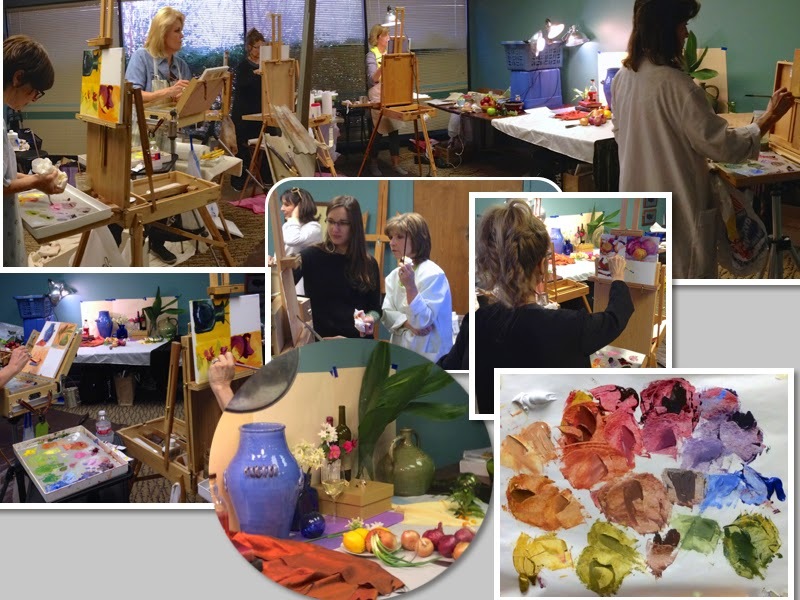 My second workshop in Shreveport, Louisiana (read all about the first one here) was a group who'd painted with me last October. Besides being incredibly flattered that they'd come back for more, I was excited to see how their work had progressed, and try out some new ideas! ...we took a field trip to the art supply store, and had a varnishing demonstration. 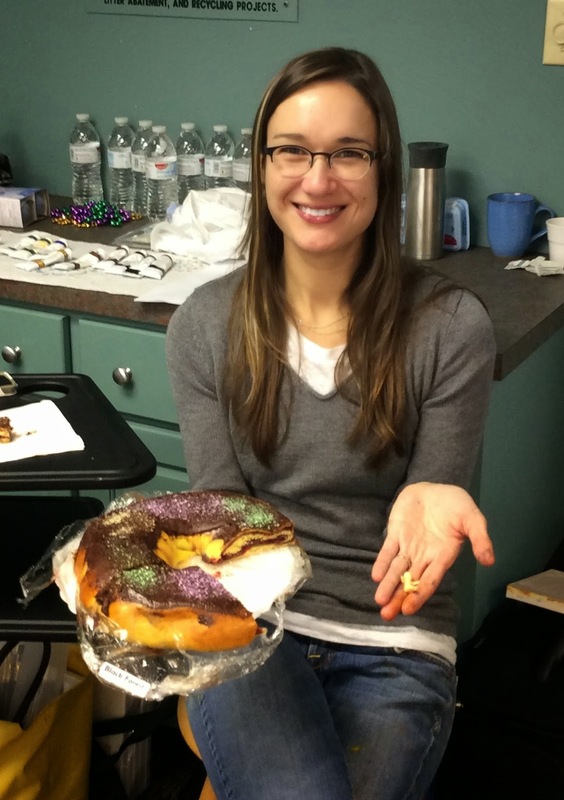 Also they plied me with King Cake! 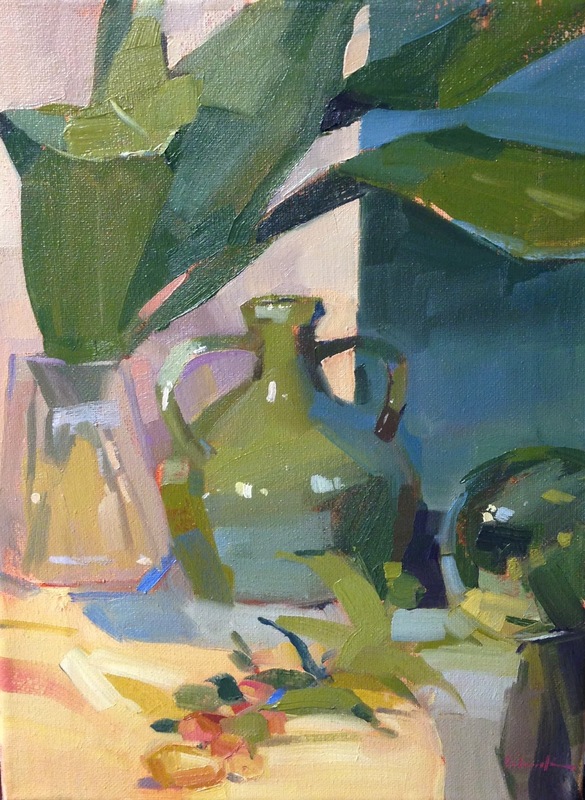 On the last day of the workshop, we set up a new, large still life, and used limited palettes - one of each of the primary colors, plus white. 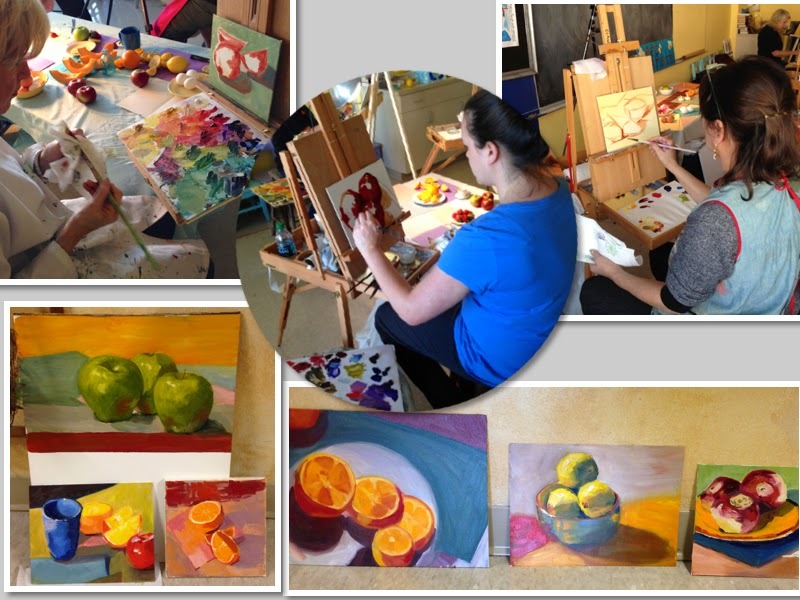 Below right you can see my demo palette: I chose Alizarin Crimson, Cerulean Blue, and Yellow Ocher. 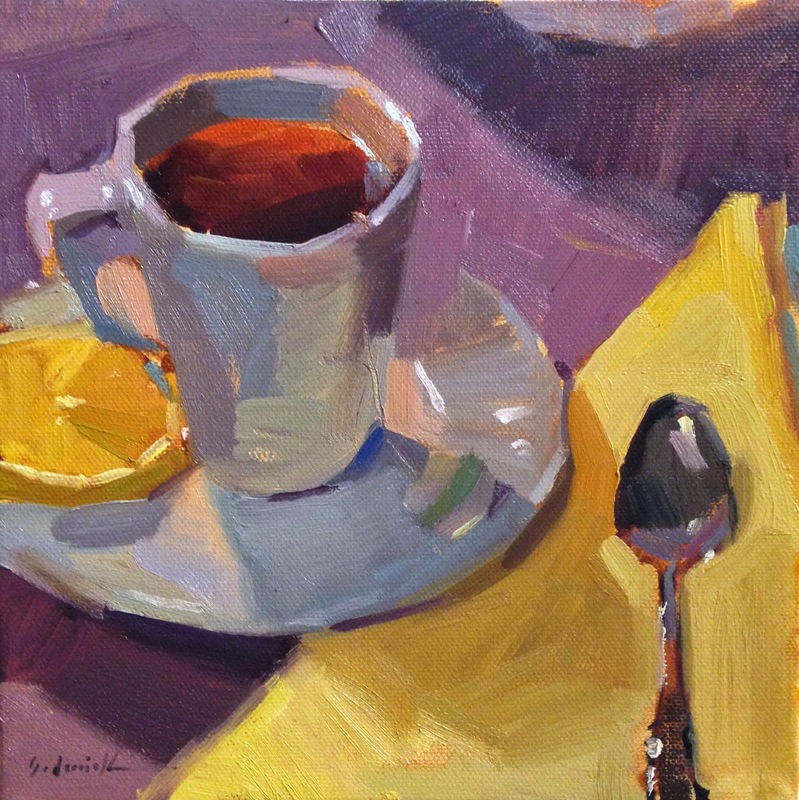 My painting had very muted yellows, as a result, but the color harmony was automatic. We all learned a ton about the unique properties of the three colors we chose! 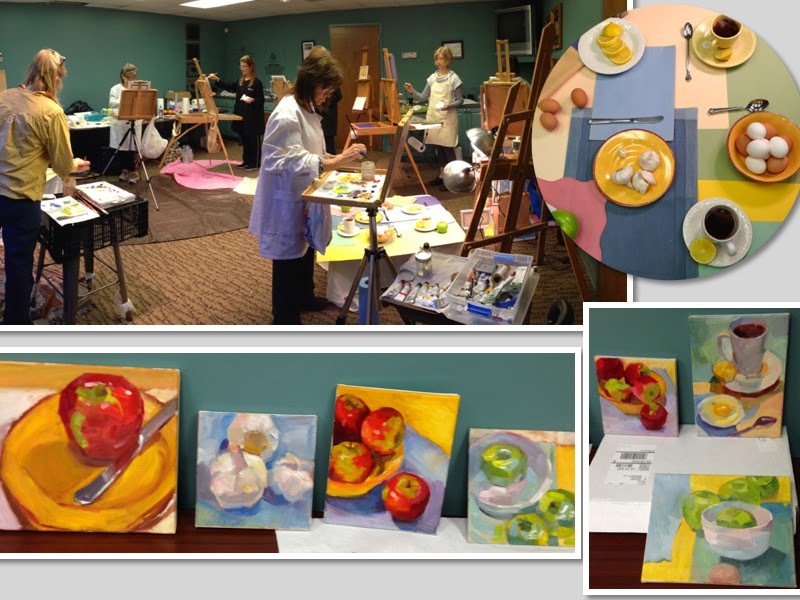 "Limited Palette demo at Shreveport"
Thanks, Ladies, for being such a great group! Can't wait until the next time. 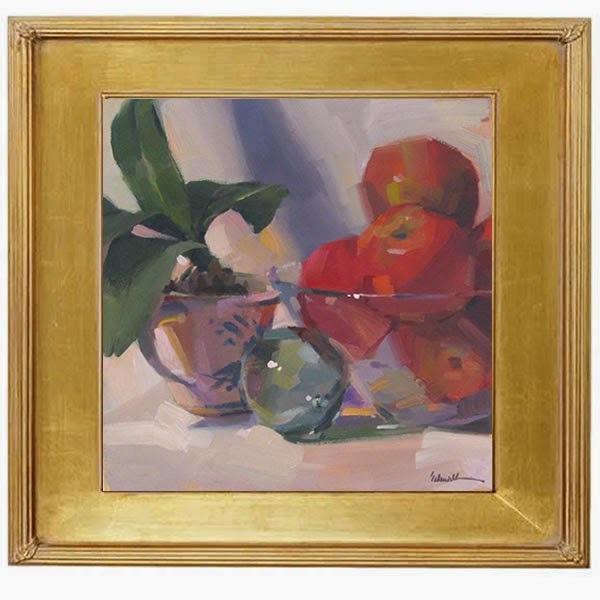 Painting the Dynamic Still Life...in Shreveport! 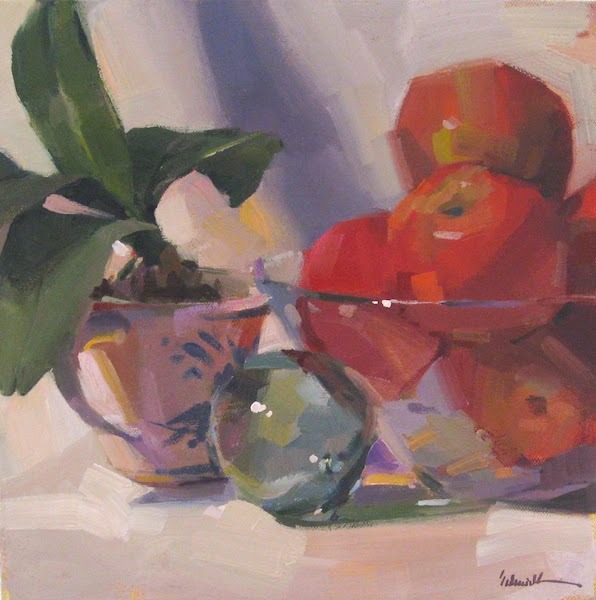 "Green Apple Demo at Shreveport"
I just got back from a week in sunny Shreveport, Louisiana, teaching two fabulous still life workshops! 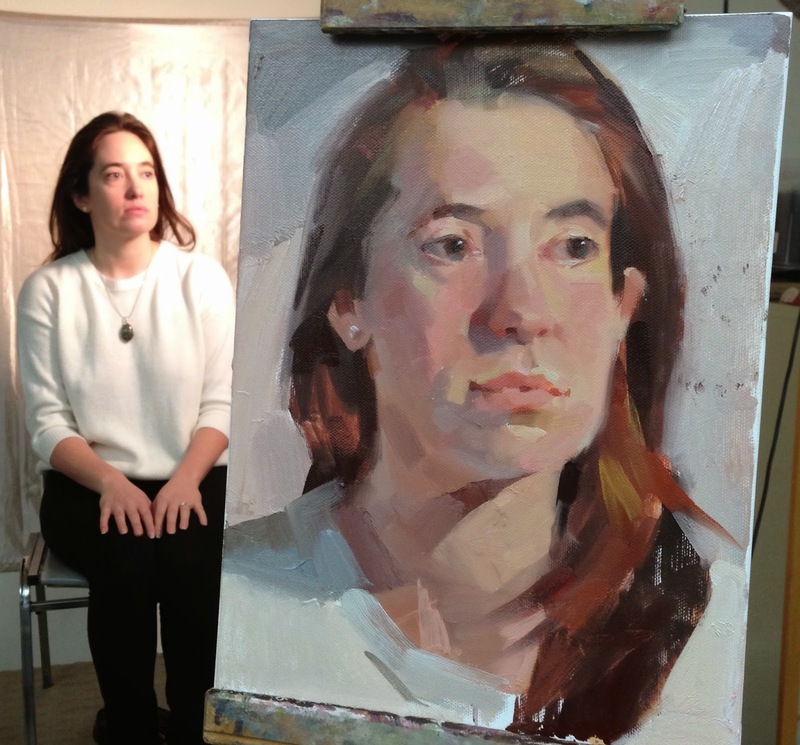 The first was a group of new (to me) students, who spent three intense days delving into values, color, and brushwork, and made some amazing paintings. 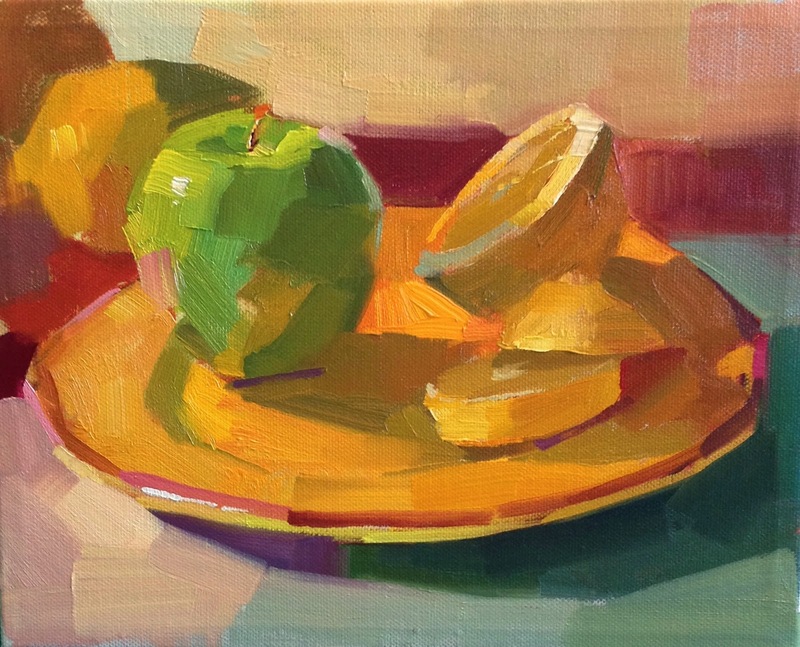 We set up three colorful, communal still life tables, and gathered around. The students got to zoom in on the subjects that appealed to them. Some painted apples, some painted turnips. All got a chance to experiment with different colors and subjects throughout the weekend. 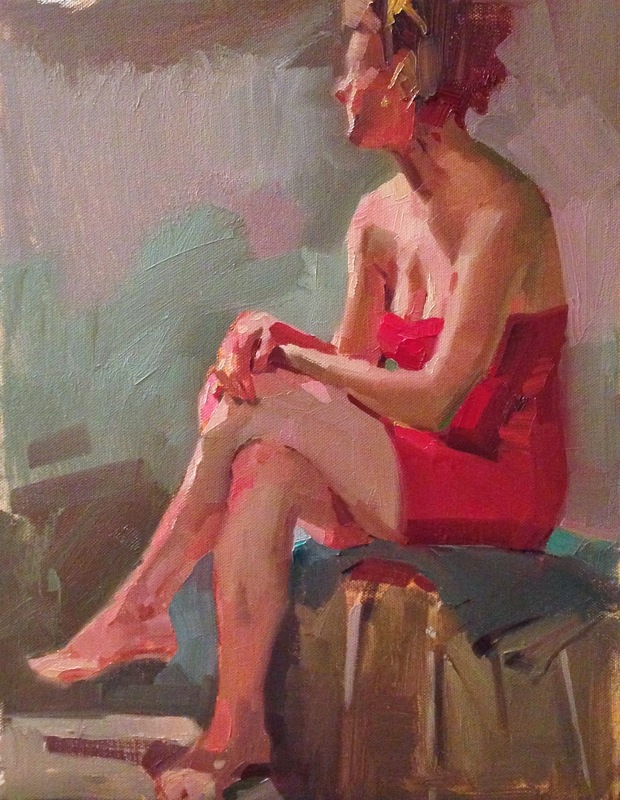 In one of my favorite exercises, we limited the number of brushstrokes used to make a quick painting. Here's my demo: two lemons, in 25 strokes! 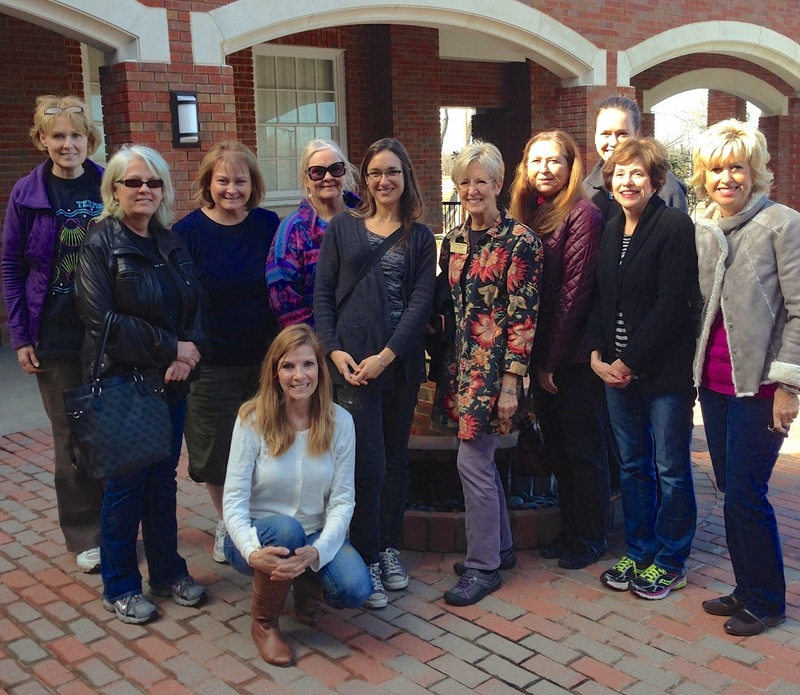 It was an enthusiastic, talented, friendly, and fun group of artists! Grateful I got to paint with you all. 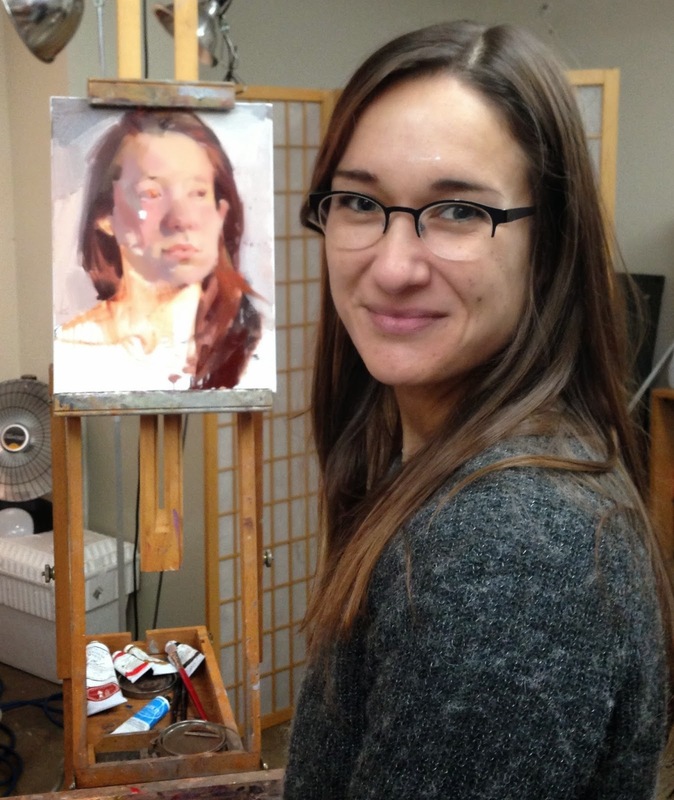 January's session of Zorn Palette Portrait was a blast, with a new model every day, two painting demos by moi, and tons of great work by the students! Here are the students' portraits of Maya. So good!! I'm already looking forward to the next round of this workshop - lining up some fresh model faces, too. 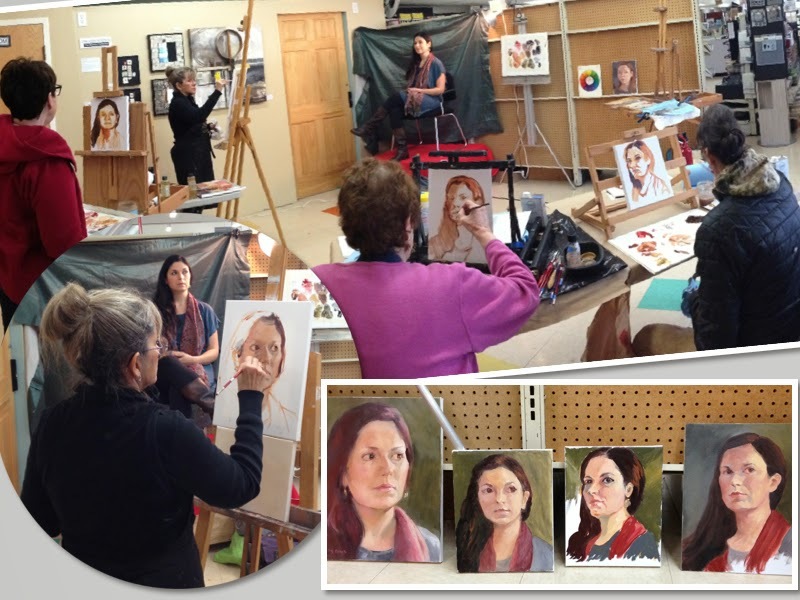 There are a couple of spots still available for February 20-22, at Oregon Art Supply. Register here!